Comet M4 Swan is now visible in binoculars in the North West in early evening from around 20:00 BST. Look out for a fuzzy 6th magnitude "star". Currently between The Plough and Bootes, Heavens Above has a finder chart which is updated daily. I took this image, which is a total of 37 minutes exposure, Saturday night. 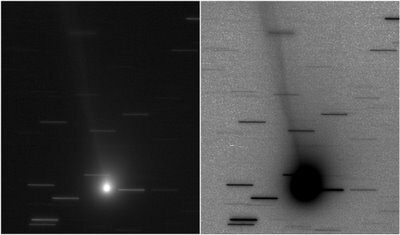 Notice how the stars have trailed as I tracked the comet moving through the field of view. The height of this image is about 1/2 degree. I could not see the tail visually in 10x50 binoculars or the 80mm refractor, only in the image. Nice photo Robin. Hopefully the weather will hold for this evening and I'll have a look with the binoculars. I managed to spot the comet in 10x50 binoculars, through slight haze and the lights of Cockermouth. Should be relatively easy under clear dark skies.